Buy Dumex Baby Milk Formula at Lazada with this coupon code and save $10! Min. spend of $100. 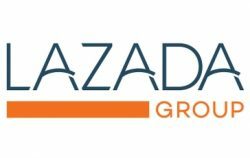 Enjoy $10 off Pampers products with this coupon code at Lazada! Valid for min. spend of $80. 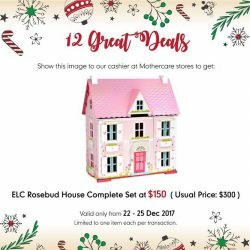 Enjoy $20 off Mamypoko products at Lazada with this coupon code! Valid for min. spend of $100. Enjoy 10% off Stokke baby products like strollers, baby bath and more with this coupon code! 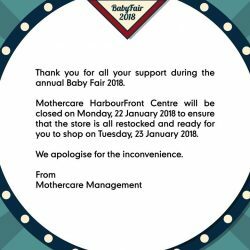 [Mothercare] Thank you for all the love and support for the MothercareBabyFair2018. Thank you for all the love and support for the #MothercareBabyFair2018. 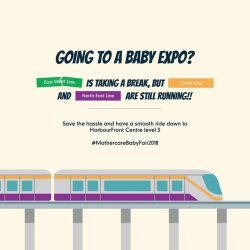 [Mothercare] GOING TO A BABY EXPO? GOING TO A BABY EXPO? 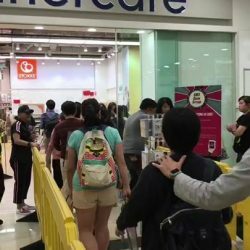 East-West Line is taking a break tomorrow, but Circle Line and North-East Line are still running. To celebrate Tula’s win as the Best Structured Carrier , we are giving one of that Baby Wearing figurine with every FTG and two $10 vouchers. THE HIGHLY ANTICIPATED ANNUAL EVENT has returned! 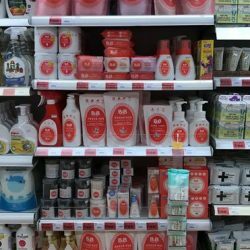 Enjoy massive discounts of your favourite brands – with over 60,000 products & over 400 brands, there’s something for everyone! Don't forget to check out these EXCLUSIVE bundle deals when you're at the Mothercare Baby Fair 2018! 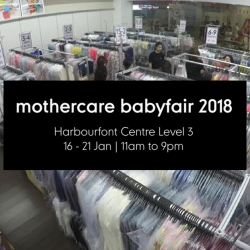 [Mothercare] Don’t forget to check out these EXCLUSIVE bundle deals when you’re at the MothercareBabyFair2018! Don't forget to check out these EXCLUSIVE bundle deals when you're at the #MothercareBabyFair2018! 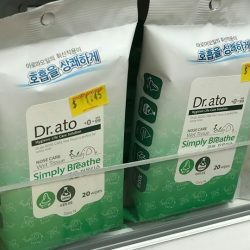 [Mothercare] Dr Ato Specialty Wipes (Simply Breathe Nose Care/Eyes & Face/Hand Sanitiser) now Buy 1 Get 1 Free! [Mothercare] We are now open! 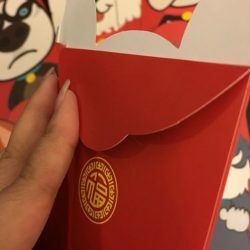 [Lil’ Bambi’s closet] Our special edition, Year of the Dog red packets are here! [Mothercare] Don’t miss out the B&B Hypoallergenic Household Cleaning Range at the MothercareBabyFair2018 – now buy 1 get 1 free! [Mothercare] Our VIP Preview Sale has started! 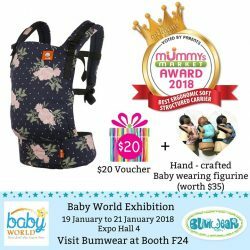 We are so pleased to announce that Tula FTG won the Mummy's Market award for Best Soft Structured Carrier after votes were taken from a few thousand mummy participants ! To celebrate this win, visit Bumwear this weekend at Baby World Exhibition for SHOW SPECIALS ! It will be held at Singapore Expo Hall 4 and we will be at booth F24. 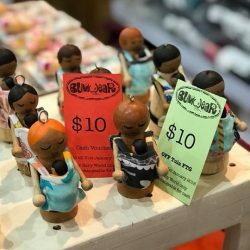 With every FTG purchase, we will be giving a handcrafted baby wearing wooden figurine (worth $35) This specially commissioned figurines will be an excellent momento of the sweet baby wearing years you shared with your baby. It can be displayed standing up or hung as a Chrismas Tree Ornament. We will also be including a $20 Bumwear voucher (to be used at our Expo booth) with every FTG purchase. 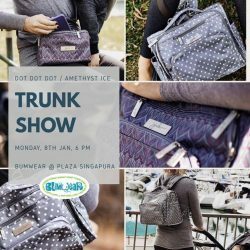 [Bumwear] We will be having a Trunkshow for Dot Dot Dot and Amethyst Ice this coming Monday. We will be having a Trunkshow for Dot Dot Dot and Amethyst Ice this coming Monday. Stocks are limited so we'll be holding it only in our Plaza Singapura location. THE HIGHLY ANTICIPATED ANNUAL EVENT IS RETURNING!Are you ready? The Mothercare Baby Fair is almost here. Enjoy massive discounts of your favourite brands – with over 60,000 products & over 400 brands, there’s something for everyone! Hurry, RSVP today! [Mothercare] This fun Whizz World Garage from ELC includes 5 fun sounds and two vehicles. HAPPENING RIGHT NOW! 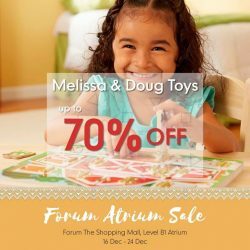 Save up to 70% off on Melissa & Doug toys at our Forum Atrium Sale! 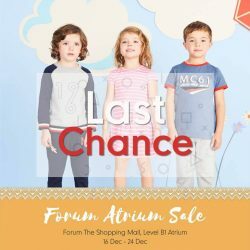 We're located at Forum the Shopping Mall, B1 Atrium and it's ending on 24 Dec! Offer also available online.